As a Chef, I chop a lot of fruits and vegetables and therefore create a large amount of food scraps. I feel bad just throwing them into the garbage because food waste accounts for 30% of landfill in the US and creates a large amount of methane. I also enjoy gardening and grow herbs, vegetables, and flowers in my spare time. The dirt around my house is not very nutrient rich (city dirt is not the rich black soil of the farmlands I grew up in) and I have had trouble getting some of my plants to grow. I don’t want to fertilize them with un-natural fertilizers and harm the Earth, so it was a logical thing for me to begin composting. 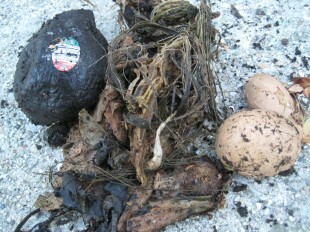 Now I can make my own fertilizer and nutrient rich soil and in doing so, keep my food scraps out of the garbage. 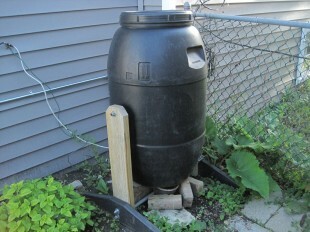 I bought my compost barrel in the Spring of 2011. I filled it all season long until the temperatures dropped below freezing every night and then I let the compost freeze for winter. I dumped mine for the first time in the Spring of 2012 and started filling it again. 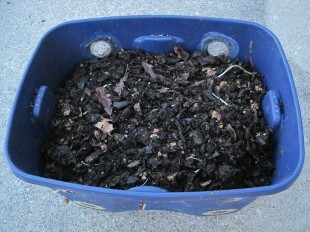 This Spring was the second season that I have composted and I have learned quite a few things along the way. -Buy or make the Composter that works best for you. I like the kind that flips over vertically because it is so easy to keep everything mixed up. Here in Chicago, there is a local company called Upcycle Products that makes them out of recycled olive and pickle barrels. -Compostable foods include most fruit and veggie scraps that you accumulate while cooking. Some people also add bread, I don’t think it could hurt, but I choose to feed my stale bread to the birds. 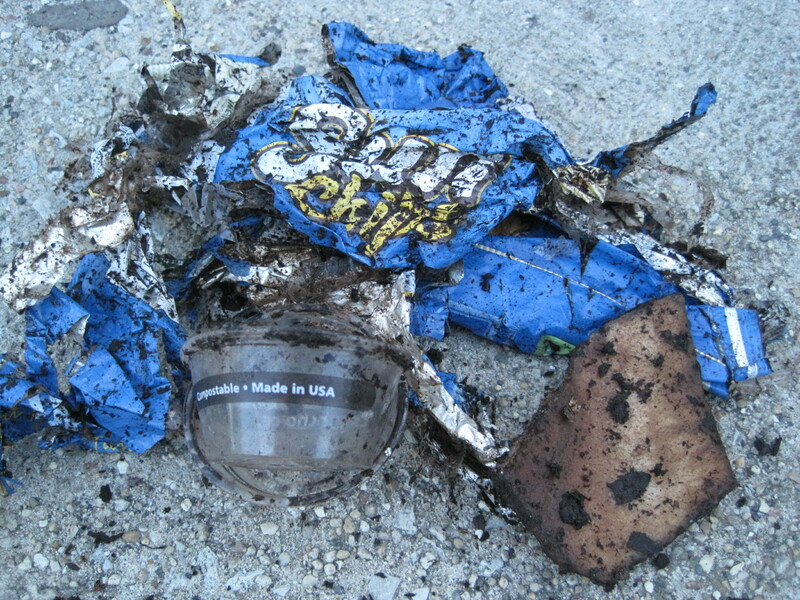 -Un-compostable items include corn cobs, pits and hard seeds from cherries, peaches, and avocados, etc. -Chicago and most other large cities require that you have a lidded composter to keep animals out. You should never put in dairy, meat or grease because they attract animals and will be bad for your plants anyway. I have never had a problem with mine. -Egg shells will get soft by next the Spring but not break down completely so I started crumbling them which helps them break down faster. Avocado skins will only get soft and crumbly after one season – they need two years to break down. Don’t add too many coffee grounds as the acid will be bad for your plants – but a little is ok.
-Newspaper is BAD! I heard that you can tear it into strips or shred it to dry out the compost so I tried that method for the first season of filling the composter. But when I dumped everything the next Spring, I found wadded up balls of newspaper that I had to pick out. They still had not composted by this Spring (my second composting season) and the newspaper is still legible! If you need to dry out the compost, dry leaves or shredded brown paper bags work a lot better. 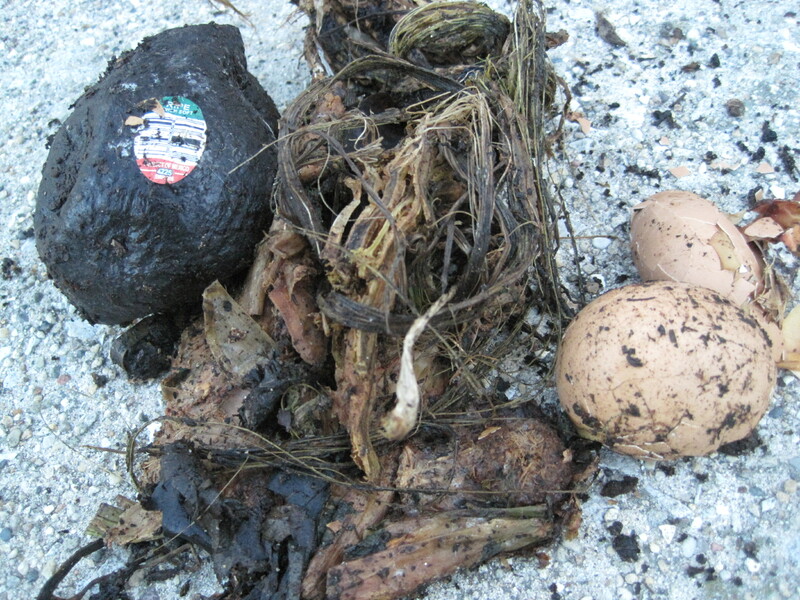 Your compost should be about 50% “green” (food scraps) and 50% “brown” (dead leaves and plants, shredded brown paper bags). -“Compostable” food packaging is great and I believe that it is a great solution to Styrofoam and other packaging ending up in the landfills. But, if you add them to your compost, you had better have some patience, because you will be picking those Sun Chip bags out of your compost for years to come. -My composter has a vent hole at the bottom to let in air and let out juices. 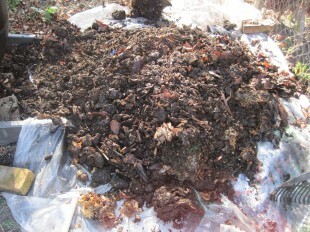 The compost was horribly stinky the first Summer because the juices were soaking into the dirt under the barrel, which also attracted flies. 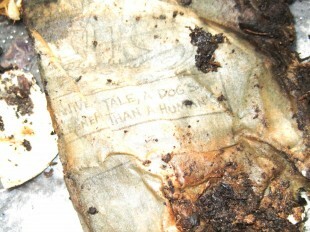 (I wonder if the newspaper also contributed to the stinky-ness in some way.) The second Summer the compost was not so wet because I started regulating it with the dried leaves and shredded brown paper bags instead. And now I catch the juices with a container under the vent at the bottom of the composter (a milk jug with the top cut off works with the height of my barrel) and pour the juices onto my newly planted or struggling plants. Viola! All natural fertilizer liquid! – Here is a photo of my finished and sorted composted dirt. See how black and nutritious it is?! Every time I plant, I add some compost dirt around the new plant or seeds. My flower gardens have been growing really nicely, and I can feel confident that the herbs and vegetables that I harvest are grown without unnatural fertilizers. I’m a friend of Joan’s and she sent us your blog. When I was gardening, I used to compost using red wiggler worms (couple of dozen from the bait shop will get you started). The compost breaks down fast—-you get lots of juice, but you may need to use it more often.